The MMi203A gives your product a powerful electronic controller. 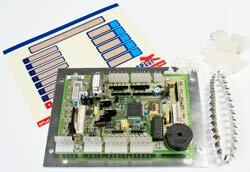 Along with digital I/O, it has analog I/O and a built in user interface. The MMi203A is an extremely cost-effective alternative to conventional programmable logic controllers and opens the door to functionality and a level of support you could previously only dream about. 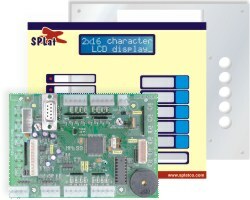 It can be programmed in our controls-optimised, easy to learn proprietary SPLat language, or in C. We can also program it for you if required. 8 x digital pins outputs with capacity up to 500mA at 24V, capable of switching inductive loads such as solenoids and relays. 2 x analog inputs, each can be configured as either: Temperature (external thermistor), 0 - 20mA, 4 - 20mA, 0 - 10V, 0 - 5V. 8 x digital inputs are rated for industrial NPN sensors up to 24V. 2 x analogue 0 - 10V outputs. 1 x RS485 port, may be used for long distance Xwire expansion bus. 1 x RS232 serial port. 1 x TTL Xwire port. 5 x Front Panel push buttons. 7 x Programmable Front Panel red LEDs, plus 1 x green Power LED. 100 year Real Time Clock (on board supercap, or bring your own battery). 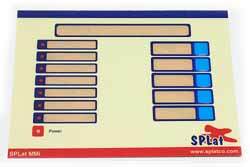 Optional 2 x 16 backlit character LCD with dimmable backlight. Beeper for button confirmation and alerts. The MMi203A is a drop in replacement for the MMi202. The connectors, board size and programming is identical. However the MMi203A has more memory and comes with a real time clock and RS485 port as standard, at no extra cost. Just like its predecessor, the MMi203A can be ordered in a few configurations. See below. Buying this kit is cheaper than buying the individual parts. 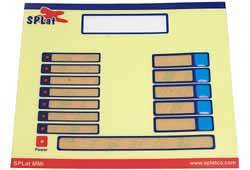 This has everything you need to get started making sophisticated controllers with data displays or menus. This is an MMi203A Developer's Kit without a LCD. Contains the MMi203A mounted on an aluminium face plate, a polyester membrane overlay which you can add your own legends to, all matching connectors. Our programming software, tutorials and other file resources are free to download from our support area. OEM versions now include matching connectors. This is the bare MMi203A board, for OEM use. It does not come with an LCD and is suitable for systems where a simple user interface is required (buttons and LEDs - on board). You can always plug in your own compatible LCD if you like! Don't forget that a display is desirable to allow user setting of the RTC functions (if the RTC is used). This is the lowest cost MMi203A no LCD, no RTC, no RS485. 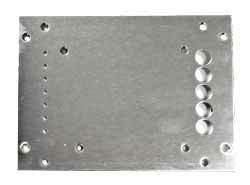 This is the same metal aluminium faceplate we use in the MMi203ADK216 kit. 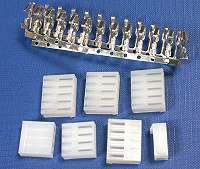 It is predrilled to suit and supplied with fasteners and spacers. This is the same polyester overlay we use in the MMi203ADK216 kit. It allows you to simply add your own legends to each of the 5 push buttons and 7 programmable LEDs. 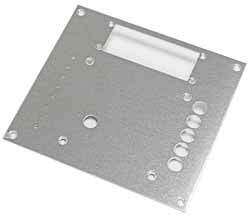 This is the same metal aluminium faceplate we use in the MMi203ADK (non-LCD) kit. 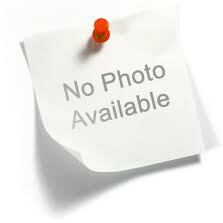 It is predrilled to suit and supplied with fasteners and spacers. This is the same polyester overlay we use in the MMi203ADK (non-LCD) kit. It allows you to simply add your own legends to each of the 5 push buttons and 7 programmable LEDs. 2x16 display without a backlight. Recommended for applications where the controller will be on 24/7 and the display is naturally lit. 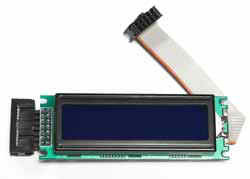 This is the same backlit display we supply with the MMi203ADK216. It is supplied complete with a connection cable and mounting hardware. This large backlit display gives you more than twice the display capacity of our "standard" 2x16 LCD. It is supplied complete with a connection cable and mounting hardware. 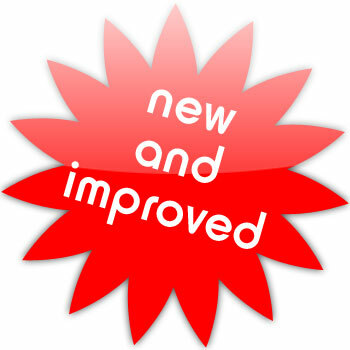 Note that we do not at present have matching metal face plates or graphics overlays to go with the 4x20 display.